Moceanu was a member of the 1996 U.S. Women’s Olympic Team, dubbed the “Magnificent Seven” after they won the USA’s first women’s team gold medal at the 1996 Olympic Games in Atlanta. She also won the all-around title at the 1998 Goodwill Games, becoming the first non-Russian to earn this title. In 1995, she became the youngest woman to win the U.S. senior national all-around title (age 13); helped the USA to a team bronze medal at the World Championships, where she was the only individual American medalist (silver on balance beam). Among her many accomplishments are: youngest member of the 1996 U.S. Olympic Gymnastics Team (14); youngest person featured on a Wheaties box (14); won the U.S. junior national all-around, vault and floor exercise titles in 1994; and five-time medalist at the 1992 Junior Pan American Games. She was inducted as a member of the 1996 Olympic Team into both the USA Gymnastics Hall of Fame in 1998 and the U.S. Olympic Hall of Fame in 2008. 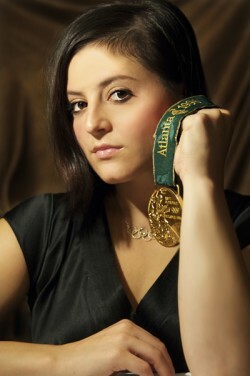 Currently Moceanu, who is married and has two children, is involved with camps, clinics, speaking engagements and appearances across the country, as well as writing a gymnastics children’s book series for middle-school students that is scheduled for release by Disney*Hyperion in 2012. She graduated from John Carroll University in 2009 with a Bachelor of Science in business management.